Soundboard and dull messages are so yesterday. Surprise Me combines texts with sounds like no other app! Select a funny, brilliant sound and add a fitting comment. Over 200 sounds for any situation are at your fingertips. Timing is important! Now, when the class's over or in the middle of the night? You decide! Engage in funny battles with your friends and family and prepare for a world of surprises with Surprise Me! Send your messages to entire groups and trigger a flash mob. Prank your teachers: have 20 cellphones sound a "boo" right in the middle of class or, if they've earned it, reward them with applause. Already working? Loosen up your meetings with well-placed fart noises through the cellphone of your workmates. And why not surprise the love of your life with a beautiful message and fitting sounds? 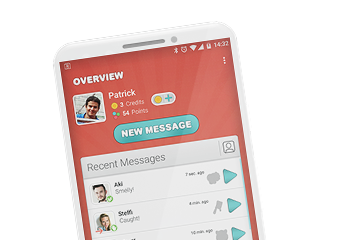 Pimp your messages with additional features and have your victim's app shake like during an earthquake or create confusion with anonymous messages. Important: you're not defenseless! You can intercept messages from others before they go off and retaliate in style. So many sounds, so many possibilities. From cute cats to gun shots and roaring zombies, amaze your friends, make them smile, make them laugh or make them cuss. Whether you'll celebrate someone with a cheerful "Yay!" or declare him a loser with a devastating "Ba Dum Tss" sound effect is up to you. Get great achievements and credits for using the app. Unlock new sounds and features for even more versatility and excitement! Amaze your friends with anonymous messages or sounds that play without any messages at all.